Before I start off writing about the my 3 day trip to Srikakulam, its various Temples, Araku Valley and Borra Caves, lemme show you something interesting that I found during the trip. I was here at the APTDC View point in GaliKonda, the highest viewpoint in Eastern Ghats. And obviously everyone (me included) were getting their pictures taken.. Some with their cell phones and others with their cameras. Here I saw a person roaming around saying "On the spot photo Rs. 30" in the general black ticket seller rhythm. I didn't even look at the person telling myself "Who needs Polaroid pictures now"
So after getting on the Bus and when it was leaving, I saw someone else's picture, it was normal photo size and printed on the regular Glossy paper.. I was wondering what kind of camera it was, then as the bus moved I saw something really unique. These guys put up a special Laser Printer, powered it via some car battery or some electric line (it was not clear as the bus was moving) and took "on the spot" printouts. I was really surprised after seeing this because we were in a highly remote location with almost no electric towers/lines near us. Now that's some "new gen" methodology! Bringing a laser printer and then printing on the spot, very economic and profitable! 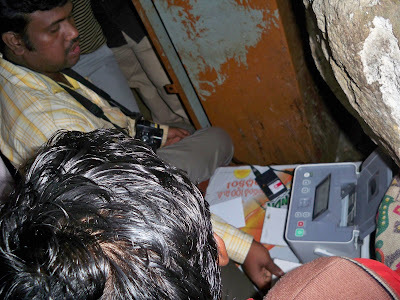 Later I found people taking power form the electric box of the lights in Borra Caves doing the same thing! This time I got a closer look and everything was clarified! The printer even had a LCD Screen! Don know, since when they are doing this, but man, no matter what, its really something worth mentioning. Now thats what I call Resourceful Engineering!
" What an Idea! Sir Jii "